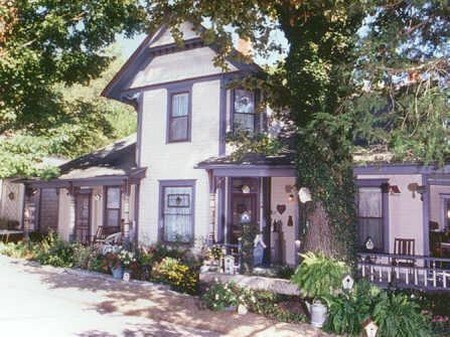 11 Singleton House is an old-fashioned place with a touch of whimsy, now celebrating 30+ seasons. Sheltering a multi award winning American in Bloom garden on a hillside in the heart of Eureka's Historic District. History of 9 & 11 Singleton St.
Singleton Street is the only street in Eureka still retaining only original Victorian houses. 11 Singleton, built in the 1890's, is Queen Anne Victorian in style. By 1892 a city fire map showed the foundation at 11 Singleton St. (the two story part with the right wing by the wraparound porch) and by 1905 the left side was added on as an apartment and was showing up on a map. It appears that the Kennedy's had renters early on. It's neighboring house 9 Singleton was showing on city maps by 1905. Both buildings were built by the Kennedy family, mostly by Fred Kennedy who was a carpenter according to the census. Fred C. Kennedy was born ca. 1860 in New York & died January 23, 1914 at 54 in Eureka Springs. He married on May 14,1902 his first wife, Pearl Ingle who was born in Indiana and died Aug. 9, 1910 at 28 in Eureka. He remarried June 9, 1910 Mary Riley born in 1855 and after Fred passed she must have remarried because she died Mary Riley Kelley Jan. 12, 1933 at 78 in Eureka Springs. Fred and both wives are buried next to each other in the Odd Fellows Cemetery here. Fred's brother, George B. Kennedy, was born in Illinois ca. 1868 and died August 10, 1931 at 63 in Eureka Springs. He is also buried in the same cemetery. George was a "Woodman of the World" and played trombone in many of the local bands. George was a barber by trade. George was married to Bertha who played the piano. She died Jan. 26, 1958 and is buried in Eureka next to her husband. George and Bertha's son, Ivor George Kennedy, was born October 6, 1891 in Sheridan, Illinois. On the 1900 census, George and Bertha Kennedy, with son, George, lived in Earl, La Salle Co, IL. Bertha's parents were both born in Germany. Now the really interesting part. The previous service listed on his registration form translates as 8 months with the Missouri National Guard, 2d Infantry Regiment of the US National Guard on the border. The National Guard was called up to guard the US border with Mexico in 1916 following Pancho Villa's raid on Columbus NM. The 2d Mo Infantry served in the area of Laredo Texas. Musician First Class is a rank indicating he was a good musician. On 5 June 1917, George Ivor Kennedy of 36 1/2 Spring Rd, Eureka Springs, Ark, registered for the WW1 draft. He listed that he was born October 6 1891 in Sheridan, Illinois, was a musician employed by the Commercial Club (now the Chamber of Commerce) in Eureka Springs and that he had previous military service as a Musician First Class serving "8 months with Missouri 2 Rgt NG US on the border. He was described as of medium height and build, with blue eyes, light hair and not bald. When he returned from WWI Ivor moved to Pawhuska Oklahoma. On the 1920 census, a George I. Kennedy of the right age, born in Illinois, was living with his parents-in-law and his wife, Mary, in Pawhuska, Osage Co, Oklahoma; his occupation was a cabinetmaker and Ivor had a millwork shop called KING and KENNEDY (Jas R King, George I Kennedy)...Planning Mill, Sash, Doors and Blinds (1925 phone book). On the 1930 census, there is still a George I. Kennedy in Oklahoma, but now married to a woman named Helen. He was still a cabinetmaker. In his later years he moved to Rt 1 East 19th St., Stillwater Oklahoma. Ivor never made it to his plot in Eureka's cemetery that he had paid on for years.